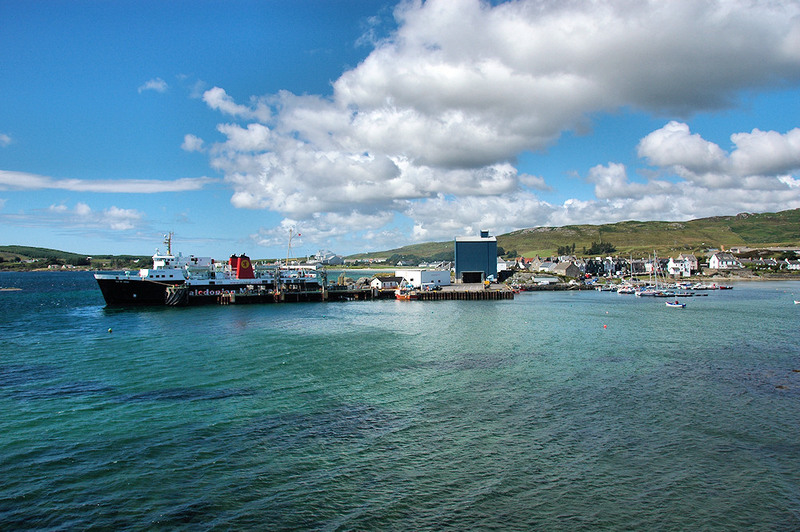 A slightly older picture of Port Ellen, the pier has since been rebuilt and upgraded, also the MV Isle of Arran is not a regular on the Islay route any more. Also the Islay Hotel has been completed since (if you look closely you can see a building under construction without a roof still, between the masts of the sailing yachts). The Port Ellen Maltings and distillery warehouses in the distance just left of centre. This entry was posted in Cloudy Weather, Distilleries, Landscape, Repost, Sea Loch, Sunny Weather, Village and tagged Islay, Islay Hotel, MV Isle of Arran, Port Ellen, Port Ellen Distillery, Port Ellen Maltings by Armin Grewe. Bookmark the permalink.